A.A.S.S.O is a surprisingly restrained work that found Fellini finally making peace with Italy's most famous artform (opera) while lampooning the pomp and ceremony associated with its patronage. It's an elegant journey that's seemingly aimless: a charming tour guide navigates our way through the cast of eccentric bourgeois stereotypes aboard a luxurious ocean liner. But it's a deceptively lightweight film whose sense of nostalgia and loss for a bygone era is deeply resonant and strangely moving. What begins as an era-appropriate sepia-tinted silent slowly begins to seep color and sound, then explodes into full-force opera. A buzzing fast-motion kitchen gives way to the slow-motion elegance of fine dining. An omniscient narrator speaks directly to the audience. The artificial sets are duly noted, one character exclaiming the painterly quality of a sunset. Fellini keeps reminding us that we are watching a movie, achieving a whimsical kind of fourth-wall expressionism. It's a blast. 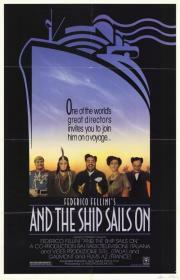 Fellini's tribute to opera doesn't have that spark of brilliance to put it alongside his masterpieces. But it does have a variety of fun characters, some unusual ideas, and a handful of really magnificent scenes. And there's nothing terribly flawed about the film, except that the fake vintage footage doesn't quite work. But artifice is part of the package, notably in some of the blatantly artificial sets and the finale, most likely meant to parallel the artifice one would see in an opera. I should probably rewatch this some time, but the first time I did it bored me, despite being a Fellini.